Titan is a high-yield, very short-season, medium-grain rice variety released from the Division of Agriculture’s rice breeding program in 2015. It offers some improvements over Jupiter, an earlier release from Louisiana that is a favorite among producers who grow medium-grain rice for cereal markets. Division rice breeder Xueyan Sha said Titan averaged 200 to 205 bushels per acre in performance trials, about 10 bushels higher than Jupiter. Cereal chemistry is similar to Jupiter, Sha said, but grain size, dimensions and quality are improved. Its milling yield is 59 percent head rice, it has low chalkiness and grain color is whiter than Jupiter. “The cereal industry and general export markets will find its grain characteristics and quality very desirable,” Sha said. Titan matures four to six days earlier than Jupiter, Sha said. It’s a semidwarf plant similar in height to Jupiter, but Titan has improved resistance to lodging. Titan has better resistance to leaf blast than Jupiter, Sha said. It is moderately susceptible to bacterial panicle blight. Foundation seed for Titan has been available to seed growers and dealers since 2016. It has been widely available to rice producers since 2017. Jarrod Hardke, extension rice agronomist for the Division of Agriculture, said Titan was grown on approximately 70,000 acres in Arkansas in 2018, which accounted for 40 percent of medium-grain acres. “It should maintain a similar market share or greater in 2019,” he said. 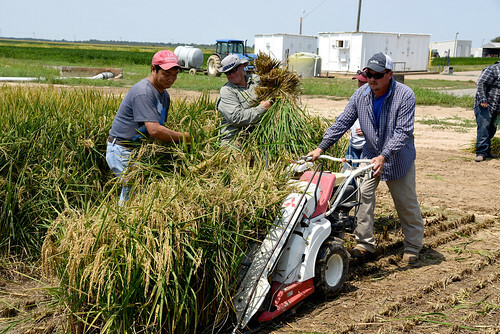 To learn more about Division of Agriculture rice breeding and research, visit the Arkansas Agricultural Experiment Station website: https://aaes.uark.edu. Follow us on Twitter at @ArkAgResearch.